The inconspicuous lot may have seemed to some just another unused public space like the many scattered throughout the city, but Ron Finley, the self-titled “gangster gardener,” saw gold and life in the blades of grass growing from the open acre. Finley turned the space into an activity oasis during the L.A. Design Festival earlier this summer, attracting individuals from all areas of the city to see the revitalized area. 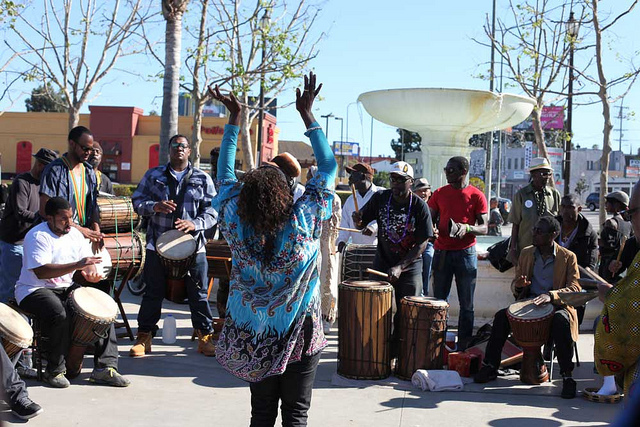 Amid discussing the disconnection of L.A.’s many neighborhoods, Finley explained that he created his event, Da FUNction, to demonstrate how converting one of South LA’s open lots also revives a sense of community connection. “We’re one city but everybody acts like they can’t go on this side of this freeway or drive down here to that area,” Finley said. Gesturing to the plot of land he calls “Mayberry in the ‘hood”, referring to the squeaky clean Andy Griffith Show neighborhood, Finley noted how a large positive crowd like the one gathered on June 13 in Vermont Square Park could be a regular occurrence. The cream colored exterior of L.A.’s oldest operating library served as a backdrop for a DJ booth blasting music that encouraged dozens to bust a move on the lawn. Hammocks and self-constructed adirondack chairs provided resting places and children’s story time while nearby food trucks provided affordable meal options, including sandwiches made of organic produce grown locally. 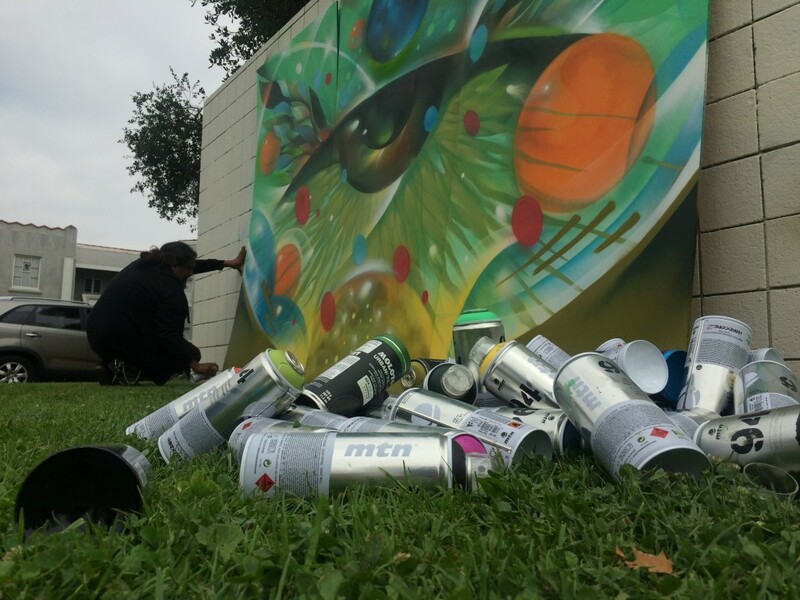 Through a number of free events, Da FUNction showed how small enhancements and regular activities in public spaces can encourage more community engagement. Zumba lessons, and yoga in the middle of the yard garnered large crowds, drawing about twenty people to each event. Those in the aerobic salsa class laughed hardily as they sweated, seemingly enjoying the outdoor activities. 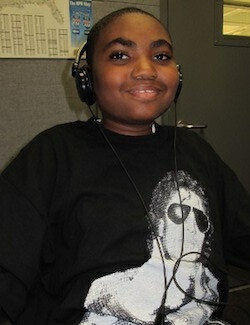 Attendees also learned and performed well-known dances like the Macarena, Cupid Shuffle and the Wobble. The day’s events also made sure to include the kids by having story time, arts and crafts activities. Though no sand boxes were present at the site, curious children did not suffer for a lack of digging. As Finley towered over one of three new Vermont Square Park garden beds addressing 30 to 40 onlookers, a toddler squeezed his way between the wooden box and Finley’s feet. Seeing the child digging his hands into the soil on his own, Finley continued his speech on the importance of sprouting community gardens in open spaces while simultaneously placing a small plant between the boy’s tiny palms. As he spoke, Finley helped the boy place the seedling in the earth he had playfully dug up. “How we activate community is through food because we can’t get no healthy food in these neighborhoods,” Finley explained. 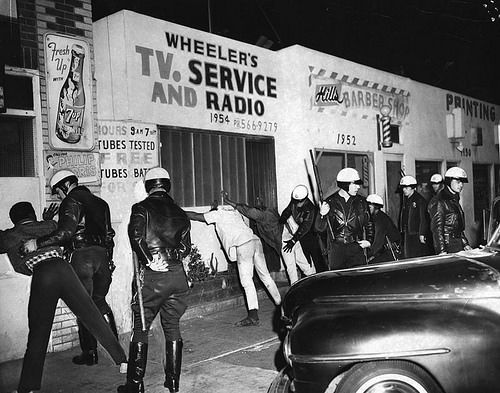 Finley referred to South LA as a “food prison.” In order to get food, he said, residents have to “break out” of the neighborhood to get nutrition. Given the limits of public transportation in this mostly working and lower middle class region, maintaining one’s health and nutrition is a challenging undertaking for residents of South LA. The urban gardener, who received widespread acclaim for his TED Talk on the topic, also explained his frustration with the bureaucratic red tape which he says makes it nearly impossible to make substantial progress on a project many feel would set the tone for a major shift in the way people perceive public space in South LA. The ideal use of space at Vermont Square Library, according to Finley’s parks and recreation plan, would include several more soil beds for a larger community garden. Alongside that garden, a container café would prepare foods fresh from the garden’s produce. Another structure will provide gardening and food education programs facilitating outreach into individual yards throughout the neighborhood, causing a shift in the community. 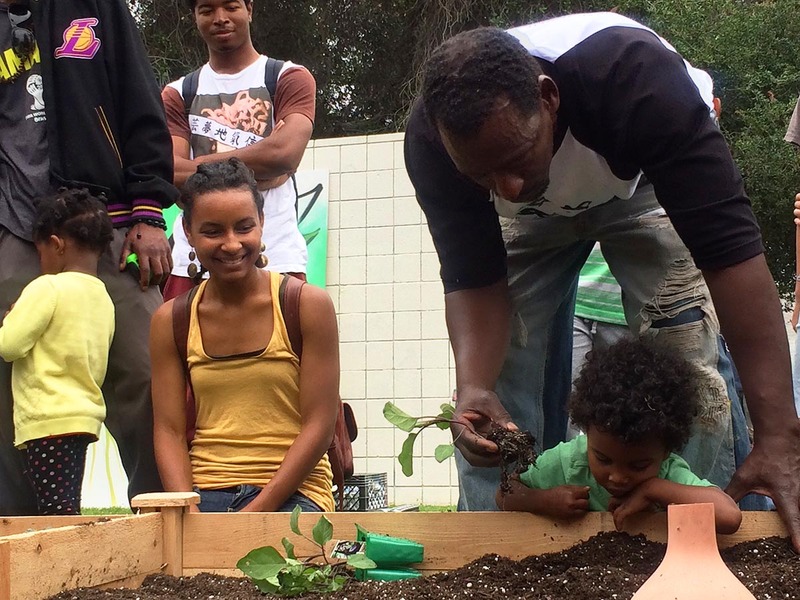 Over time, he said, South LA will become a food oasis. 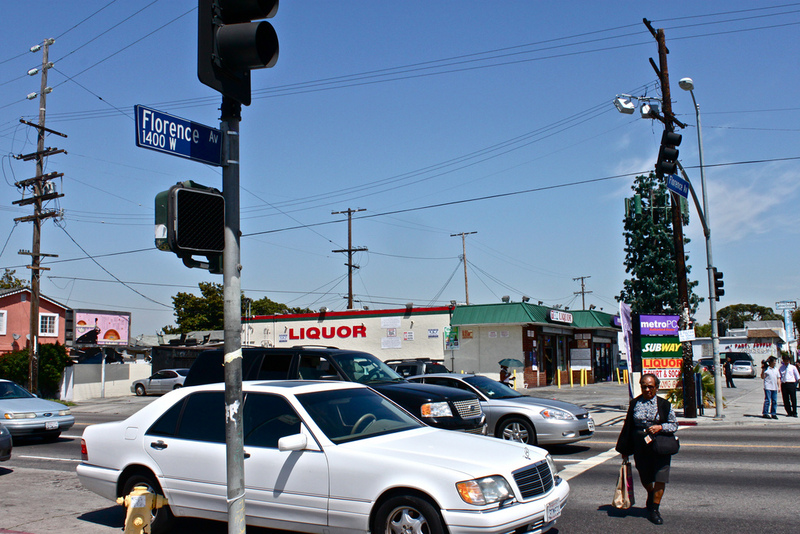 Finley isn’t the only one seeking to fill South LA’s food desert with more resources. Plans are underway to bring a 25,000 square foot Numero Uno supermarket to the lot of the former Broadway Hospital on 94th Street and Broadway. Involved community members can even become lifetime members of the SoLA Food co-op, a natural foods market that will be stocked full of healthy, beneficial foods and essentially owned by its shoppers. As the park filled with hundreds of individuals strolling in for the community outing throughout the day, event-goers echoed Finley’s call for drastic changes to the neighborhood’s food culture. Part of South LA’s shift to instill fresh eating within the community is understanding the system of how food comes to a neighborhood, explained Erin Roediger, a Da FUNction attendee and certified health coach from Venice Beach. L.A.’s current political structure, Finley said, no longer works for those seeking healthy food options. Finley said he went through a maze-like process in order to contact the appropriate individuals to help him create his large-scale public garden. In the end, Finley said, he paid for much of the event out of his own pocket and was disappointed with the lack of governmental support despite officials expressing their interest in Finley’s vision. Roediger, a Da FUNction attendee, said she knows exactly the vision to which Finley is referring. A child of the 80s, Roediger said she grew up eating foods from mass supermarkets, like Lucky Charms and other foods laden with artificial coloring and chemicals. Dolores Sheen, co-founder of the Sheenway School and Cultural Center that hosts the only 4-H Club in South LA, said planting also helps facilitate deeper relationships between community members. 4-H is the nation’s largest organization that connects young people with the National Institute of Food and Agriculture of USDA, land grant universities and county government to resource learning opportunities for youth through animal care, farming, gardening and more. 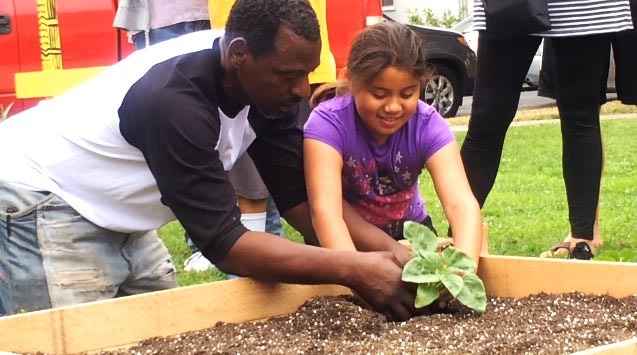 By working with elementary-aged children, Sheen said the benefits of gardening stretch beyond teaching the children where food comes from. With so many “negative distractions,” Sheen said kids in the neighborhood aren’t exposed to nature and do not have the opportunity to take part in something outside of themselves. Sheen said gardening can provide people with a sense of ownership and pride. Finley said he wants to continue transforming open spaces throughout South LA via a combination of garden beds and the arts to make sure people have opportunities to take an active part in their communities. “I want us to activate this and tell these politicians what we need to happen in our community,” Finley said as he addressed the crowd. Bending down to pick up a small plastic pot with a stem of large green leaves reaching out, Finley singled out an elementary school girl in a purple shirt, asking if she’d like to plant. When she nodded yes, he revealed the plant to be a sunflower chosen just for her. In a collaborative effort, the two loosened the soil surrounding plant from its small container.. Working together, they placed the growing stalk into a larger plot to be properly nourished and encouraged to grow tall. The girl beamed with accomplishment firmly pressing down on the last layer of soil, as she stared down at the work she had done — an initial step in transforming the area with her own hand.